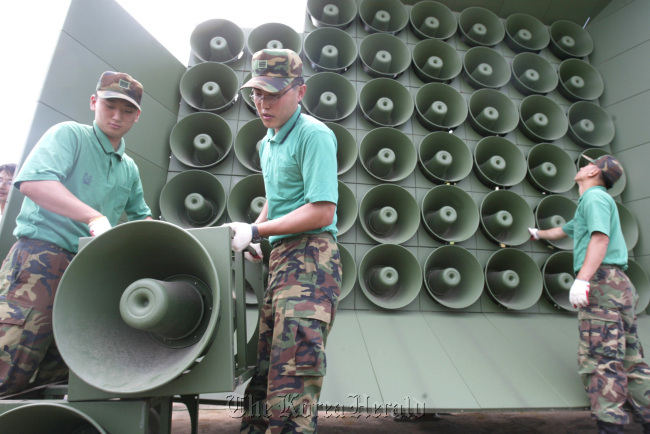 Though it came to a close just 15 days after breaking an 11-year hiatus, South Korea’s loudspeaker broadcast along the heavily fortified border proved to be formidable enough to rush a defiant Kim Jong-un regime to the negotiating table and extract concessions. The equipment became idle as of noon Tuesday in line with the two Koreas’ agreement earlier in the day. Pyongyang, for its part, expressed regret over a land mine explosion on Aug. 4 that nearly maimed the legs of two South Korean soldiers. The South Korean military had resumed the broadcasts on Aug. 10 in retaliation against the mine provocation. The North instantly responded with fury, firing artillery shells last week near a loudspeaker erected in a western border town, declaring a “quasi-state of war” and forward-stationing offensive assets and troops in full combat readiness. The apparatus, an apparent source of great sensitivity to the North, had been disassembled and reinstalled according to the relations between the two Koreas since it was introduced in 1962. Before the latest installment, the loudspeakers were pulled out in 2004 as a result of cross-border military dialogue, but were reinstalled in 2010 at 11 spots along the Military Demarcation Line after the communist regime’s deadly sinking of the South’s Cheonan corvette. They were not used at the time. Through them, the South resumed broadcasts of the “Voice of Freedom” show, a rare source of outside news and music for North Korean frontline troops and residents of border regions caged up in the reclusive society. The programs, both before and after the 11-year hiatus, included news of the executions of North Korea’s elite military executives and other power struggles within the top echelons, information about the lives of the South Korean middle class, regional and global issues including human rights and lighter content, such as weather forecasts and music. The program would resonate across the border for three to four hours a day on an irregular basis. Many defectors who resettled in the South have testified that they had first come to know about the South and the outside world through the broadcasts, which can travel as far as 10 kilometers. This means that those walking down the streets of the North Korean border city of Gaeseong may hear the sounds seeping out of the speakers run by the 1st Infantry Division headquartered in Paju, Gyeonggi Province. The program carried four main themes, each aimed at promoting freedom and democracy, illustrating South Korea’s political and economic ascent, recovering national unity and revealing the reality of the regime, according to Seoul’s Defense Ministry. Among the songs most recently played were “Heart” by IU, “Genie” by Girls’ Generation, “Bang Bang Bang” by Big Bang and “Between You and I” by Noh Sa-yeon, officials said. “The content and scripts change every day, though the main topics stay the same,” a ministry official said on condition of anonymity due to the sensitivity of the matter.